Husqvarna riding lawn mowers are built for performance and duability. Thanks to a wide range of attachments and a built-in choice of cutting methods. 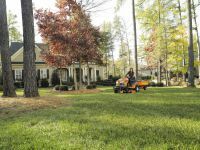 Our lawn tractors provide the versatility to not only cut your grass, but also make quick work of many of the tough jobs on your property year round. It's time to start getting more out of your riding mower. For more on Husqvarna's line of Riding lawn mowers. visit this page.